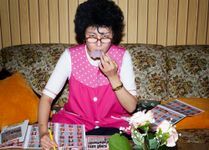 In Rie Yamada’s absurd investigation into the family album, the photographer restages family portraits, putting herself in every role. Each family album is more than the sum of its parts. Aside from the intimate personal value it holds individually, it is also a repository of historical and cultural information. 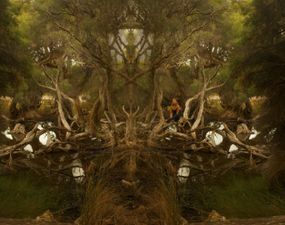 It represents how we want to be seen, making it a reflection of the times it was produced in, and a reflection on the shifting sands of vernacular photography. In the age of Instagram and Facebook, the physical family album is at risk of becoming obsolete. For photographer Rie Yamada, the family photograph is a goldmine—and a whole album of them is even better. Fascinated by the practice of making family photographs, from snapshots to more performative group portraits, she embarked on an ambitious project to re-stage a series of 10 photo albums—five from her adopted home of Germany, and five from her native Japan—picked up in flea markets and from online auctions. Playing each family member herself, Yamada becomes part of the family, inserting herself in an array of different roles to question: what makes a family? In this interview for LensCulture, Yamada speaks about searching for a sense of belonging through photography, the changing nature of the family album and the intricate process behind each of her images. 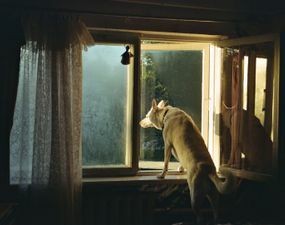 LensCulture: In previous projects, you photographed people in their intimate spaces: homes and bedrooms. What is it about this encounter between you and your subjects that interests you? What would you say are the main themes that drive your work? Rie Yamada: Before—and shortly after—I arrived in Germany, I was interested in the people I met in my daily milieu, or people in similar situations and environments as myself. Despite drawing a boundary between myself and others, I think I was looking for a sense of belonging, closeness, and relief. The more restless and hectic the city is, the more people need a small, quiet inner space. By perceiving the subjects’ homes and private spaces as small ‘containers’, I could read into the their personal stories, solitude and, at times, imaginary worlds. As the years passed since my departure from Japan, and since I have settled into my life in Germany, various occurrences in my life shifted my interest from individuals to families. LC: In some sense, Familie Werden continues these encounters with strangers—but this time in the past. What drew you to the family album as a starting point, particularly in an age where it is at risk of disappearing? RY: The subject of family has been repeatedly examined in the history of art and photography. Families are a collection of people that embody the cultural and historical backdrop of the time. Thus, family photos exemplify the cultural and historical background, and are a reflection of society of the time. The popularization of cameras over the years brought about various forms of family photos. Despite the fact that they are the most familiar and invaluable form of photography for us, they are often left forgotten in boxes and albums, or are disposed of—as was the case with the photos that I acquired. That being said, I realized that the question of ‘family’ is not one with an easy answer, especially in a time when individuals are increasingly becoming the basic unit of society. So I decided to start by looking at families and family photographs from the past. LC: Tell me about the origins of the project and how it started. RY: Family portraits are constantly evolving. Today, anyone can take family photos on their smartphones, but these photos are seldom printed. After the great earthquake and tsunami in Japan in 2011, I read that more than anything else lost in the disaster, survivors wished they could have their family photos back. And so, there were many projects where volunteers found, cleaned, and returned family photos to their owners. I found this very interesting, and it got me thinking about families. LC: How many family albums did you use? Where did you come across them? RY: I collected five German family albums at flea markets in Berlin and five Japanese family albums on online auctions. I selected them based on one condition: that they contain more than 100 photographs of a given family, so that I can understand the family background, including their structure, time, and place. LC: The images you choose are very diverse, but the thing that really unites them is that the subjects are always conscious of the camera’s presence. Why was this self-awareness important for you? What was your criteria in picking which kind of photograph to re-stage? LC: You play every role in each image. Tell me about this impulse to insert yourself into these unknown families. RY: I spent a lot of time getting to know these families through these photos. And because I knew these families so well, I felt responsible for portraying them myself. To understand these families and family photos of the past, I thought it best to actually ‘become’ the family. And of course, I am my best model! By playing all the roles—both male and female—I wanted to show that today, there is no one correct form of family. We live in a time where we can choose our own families. LC: Your (often multiple!) presence, and the theatricality of the re-staged set draws attention to the performance of the original image. What did it feel like to play out all of these different family archetypes? RY: Oddly enough, standing in front of the camera in similar-looking clothes, makeup, and hairstyles—I felt as if I were becoming a part of these families. Playing the roles of various individuals through this project also made me think about my relationship with my own family, and I learned things about my family history that I didn’t know about before. LC: The family album is a fairly universal practice—something that spans different geographies, time periods and cultures. 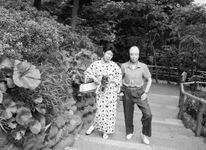 In your project, we see black and white images in traditional Japanese dress, as well as bright domestic snapshots from what looks like a Germany family home in the ’80s. Was there something that drew all of the images together, or did you come across a diversity of approaches? What makes a family photo? RY: Despite the different backgrounds, household items, clothing, and times, I didn’t notice any significant differences in way the Japanese and German family photographs were taken. Photos taken in studios emanated that typical family image, while snapshots taken by family members chronicled the stories of the family. Every family had existed in a moment in time, and I imagine, or at least I hope, that their stories are being carried on into the future. Today, photography has become an individual act, and family photos are seldom collected in a family album. Photographic interests have shifted to oneself and photographs of daily life. However, we must continue taking family photos. Photographs strengthen the continuity and alliance of the family as a group, firmly establishing it with the help of a visual image. The act of taking a photograph together is a way to reconfirm and reinforce the family bond. It may only be a pretence of a family, but perhaps the family becomes a family through being photographed. The photographs are a proof of our existence. LC: Tell me about the process of shooting one image, because there seems to be a huge preparation process of art direction and make-up involved! How long did each shot take? Did you work with a team or was it all a one-person show? RY: First, I would go through the family albums and their huge amount of photos many times, gathering as much information as possible about them. I searched about for clothing and props that are as similar as possible to the originals; when I couldn’t find anything suitable, I made them myself. If I was able to place the original location, I would go there to shoot. If not, I looked for similar locations or prepared backgrounds and created a set in a studio. I shot the photos using a self-timer, and I did my own hair and make-up wherever possible. My friend and my sister, who are hairstylists by trade, would sometimes cut my wigs or teach me how to wear it like in the original. To make sure the shoot ran smoothly, and also for the behind-the-scenes shots, I often had one person assist me. In Japan, they would be my family, and in Berlin, my friends. For the Japanese wedding photo, it was impossible for me to dress myself or to move about on my own, so a total of six people, including my family and cousin, helped me with the shoot. From research to the first exhibition, the project took a total of four months, so I generally worked on multiple families at the same time. Most family photos took about one week, but there were families where it took more than two weeks to prepare all the props for the photo shoot. LC: You’ve also made a photobook of the project, which includes other artefacts and images, and when you exhibit the work, these additional physical touches are also present, almost shifting this imagined new family into reality. Tell me about these additional details, and why you chose to add them to the narrative. RY: At the exhibition, photo albums that I created using the original photographs are displayed underneath my re-staged photos. These albums also contain fictional stories about the families based on the time period in which they existed. The stories, props, and photos of these families weave in and out of memory and oblivion, fiction and reality. I also exhibit my behind-the-scenes book to show the visitors what I did and what I intended to do, and so they can enjoy my works from a different angle. LC: What’s the next step of the project? RY: Familie Werden is the first part of a three-part series focusing on the past, present, and future of the family. The second part of the series, which I am currently working on, is about exploring present-day forms of families by taking part in ‘partner hunting’ events and using ‘rental family’ services in Japan. The third part will be about myself and my future family. Editor’s Note: Rie Yamada is part of Futures, a new photography platform that pools the resources and talent programmes of leading photography institutions across Europe in order to increase the capacity, mobility and visibility of its selected artists. Check out the other amazing artists of Futures here. 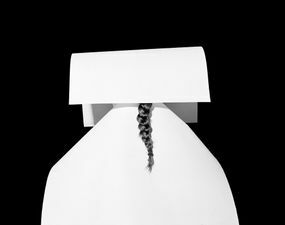 Documenting her exploration of the body in relation to memory and space, artist Patricia Voulgaris creates magnetic photographs that invite her viewer to contemplate their own physical presence in relation to their surroundings. 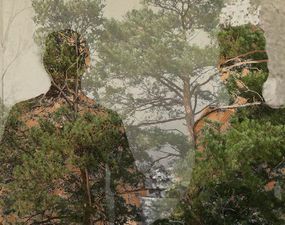 A conceptual view of life in contemporary Latvia—showing the ordinary in the form of a mysterious fictional photo narrative. 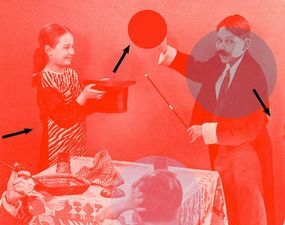 Optical illusions, common photo glitches, deception and misdirection — a look at magic, perception and belief. These popular nineteenth-century cabinet card photos have been artfully adapted to make the humans look nearly invisible, while allowing the picturesque natural backgrounds to take center stage.